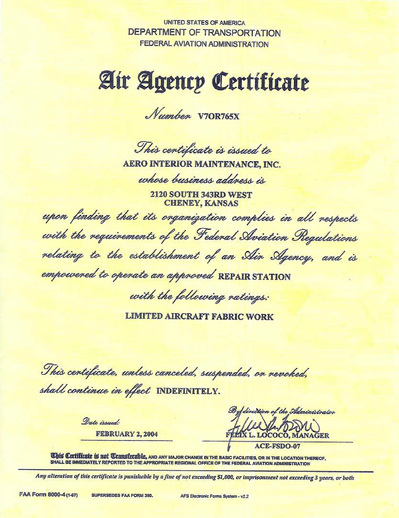 FAA approval letter for process specification "CGI-1000 Leather & vinyl repair and restoration"
How Important are FAA Certifications? It is not enough today to have products that are tested to not alter the existing burn certificates. As an aircraft owner, for true peace of mind, you should also confirm that the controls for the proper application of these products are also in place. This is best accomplished through a proven quality control system, achieved by using the services provided by an FAA repair station. The repair station should be familiar not only with the products to be applied–but just as important with the rules and requirements of the FAA for this type of application. Many companies have tested their products to prove that they will not alter existing burn certificates but what they haven’t done is create an FAA repair station that controls who uses these products, how they use them, and how they will qualify their work. This is called a quality control system. Using an FAA certificated system will assure that trained people are using these products, these products are traced from point of origin to point of use, and a quality control system is used to issue FAA approved paperwork to the aircraft owner returning the aircraft to service after the maintenance we provide is completed. AIM uses either FAA form #8130-3 or logbook entry forms at the customer requests. Rest assured that existing burn certifications will not be voided when AIM maintains your interiors.